It seems like we've been doing a lot of overeating lately. Too many good desserts and things like grilled cheese sandwiches to keep up with all the blogging events. I also find that when I go to markets like the one at St Jacobs, my eyes are way bigger than my stomach. Good thing we don't take a cart with us. It forces us to buy only what we can carry (still too much, actually). Anyway, I have these beautiful yellow beans that I didn't get to use and so I decided to turn them into a healthy salad. Leafing through my favorite vegetarian cookbook Quick Vegetarian Pleasures I found a recipe for green bean salad with lemon, dill and feta and was sure I had all the ingredients. That was until I looked in my fridge. The feta was hidden way in the back of the fridge and looked quite atrocious so I used coarsely grated parmesan instead. What - no dill!!! Well that bunch of basil is starting to wilt so I just used a handful of that instead. Here's the really brilliant part....I thought it said tomatoes and since my honey is not a fan I substitued red peppers It really said red onions. Oops, how could I mix that up? 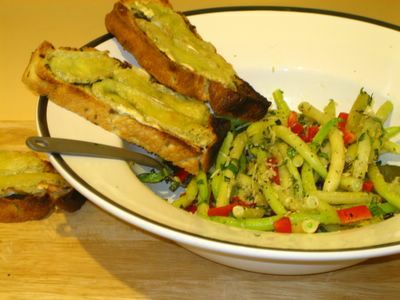 Anyway, dinner was simply Yellow Bean Salad with some focaccia. (There can never be too much basil or garlic in any meal!!!) followed by some of those delicious plums we picked up at the market as well. After dinner, which we truly enjoyed, I wrote a note in the cookbook about my changes . It's how I keep track of what recipes I've tried, liked/hated, and what, if anything, I'd do differently. I know some of you are aghast at the notion of messing up a wonderful, pristine book, but personally, I love it well worn. When I open one of my many cookbooks, I don't just find a great, tried and true recipe, I find a memory. Over the years friends have bought me plexiglass protectors to use during preparation but I never use them. I've even had people offer to buy me new versions of a couple that no longer have spines, like this one. 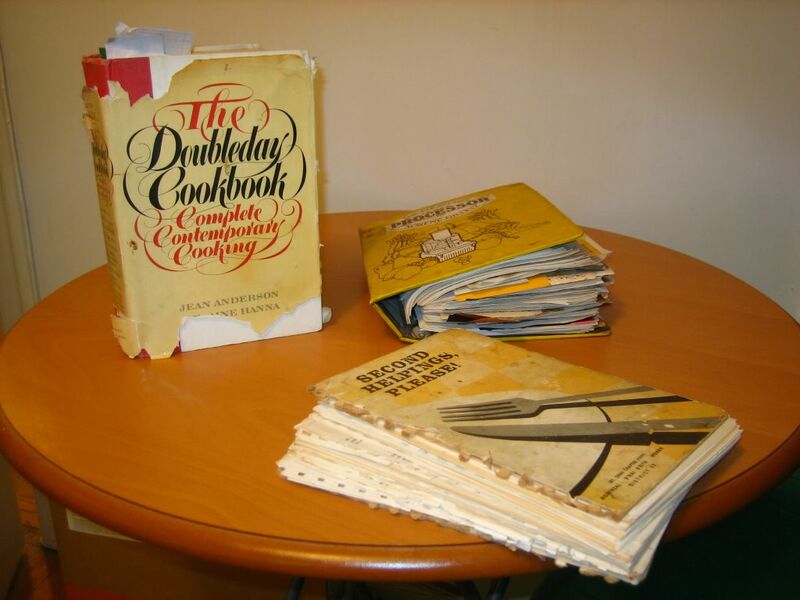 What do your favorite cookbooks look like? Do you fall into pristine or well worn? I'd love to know. Sometimes I love those spontaneous, thrown-together dinners best. Yours looks lovely, as always. And my best cookbooks? They have splotches on top of all the pages, where my fingers covered in butter or gravy or red pepper juice went back for one more check and left their marks. All their spines are nearly broken, and most of the pages are dogeared. The pristine ones are either a) relatively new, or b} filled with bad recipes. My pristine ones, like yours are relatively new, have only one or two recipes I found interesting enough to try or were the "what was I thinking when I bought this???" variety.